One of the most interesting aspects of the London Design Festival was the variety of shows included in the 9 day celebration. From the larger “bigger brand” shows like Decorex and 100% Design to the smaller venues like Origin that showcased the work of artists and artisans, there was inspiration everywhere. 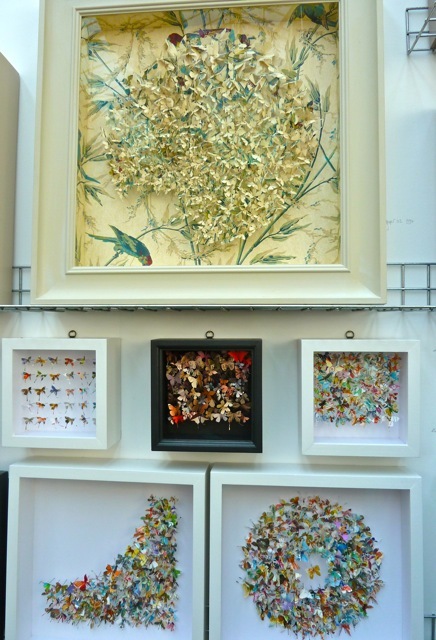 Her work has a delicate ethereal feel that seems to float in the shadow boxes. Claire Brewster, another paper artist, also works to revitalize what would normally be discarded, “celebrating the unwanted and giving new life to the obsolete”. 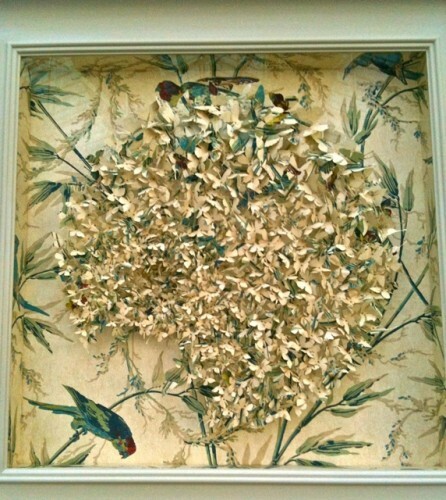 Her art is made from old maps and atlases and reformed into natural shapes of birds, insects and flowers. 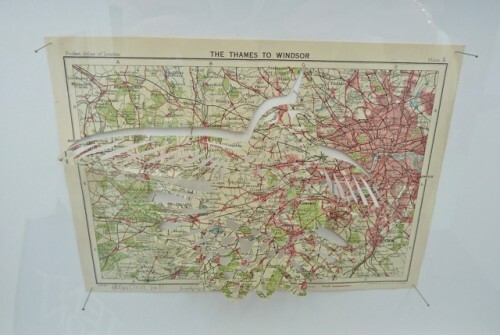 A different approach to paper is the art of Gill Wilson. Geometric in nature, her medium is organic plant fiber, inspired by her travels in Japan and India. The pulp is then hand dyed and formed to any size. Gill’s work has a purity and almost mathematical essence that is very architectonic and serene. 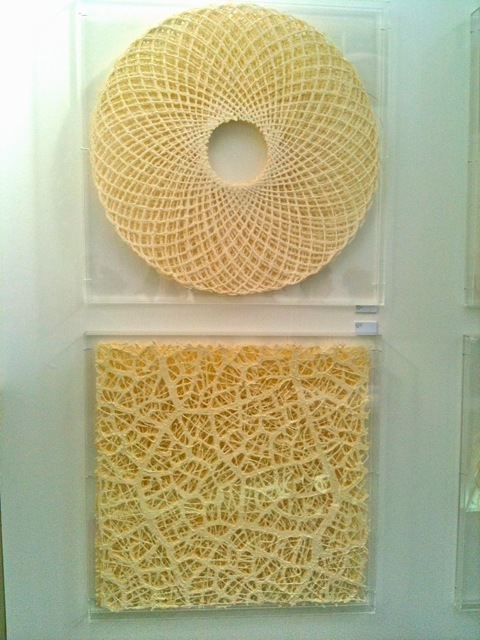 In fact she says her recent work is inspired by sacred geometry. 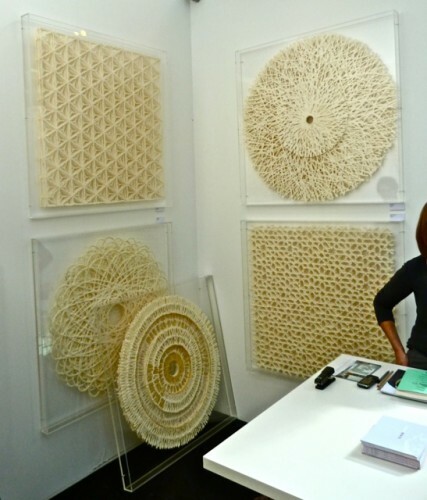 I think her work would be spectacular in the right space – it is graphic and dramatic yet neutral and almost contemplative, referencing the geometry ubiquitous in all natural forms. 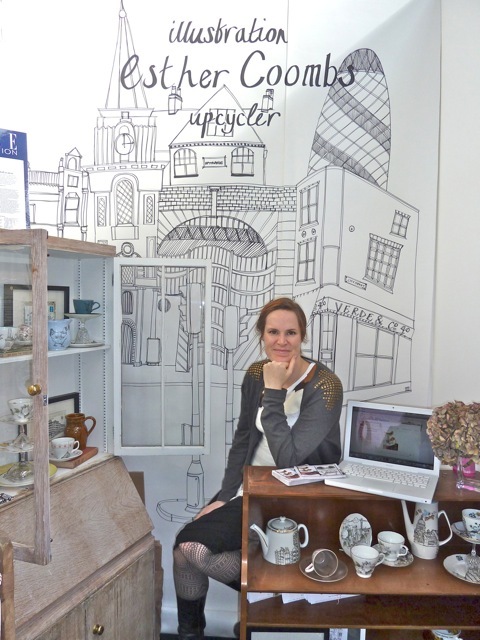 Esther Coombs is yet another artist who upcycles to create her art. 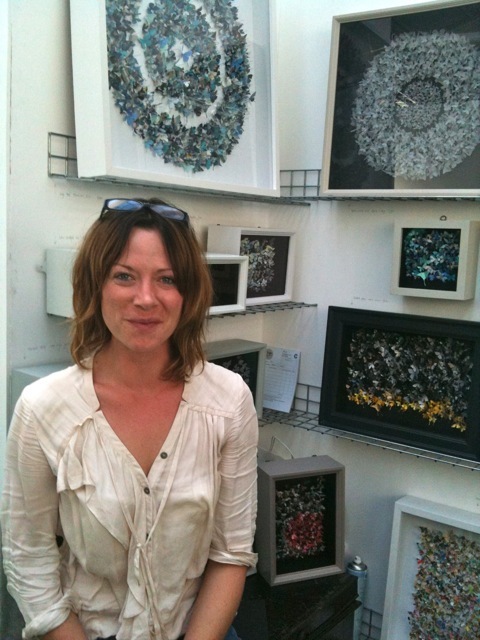 Like several of the aforementioned artists, she repurposes found or discarded objects to give them new life and meaning. Her nostalgic homewares include vintage ceramics that she newly illustrates, as well as up-cycled printed tea towels and pillows. These vintage finds combined with Coombs decorative illustrations are a charming combination. In addition, Coombs was commissioned by Anthropologie to create a wallpaper for their collection, only available here in the US. It lined her booth as a background for her other work. 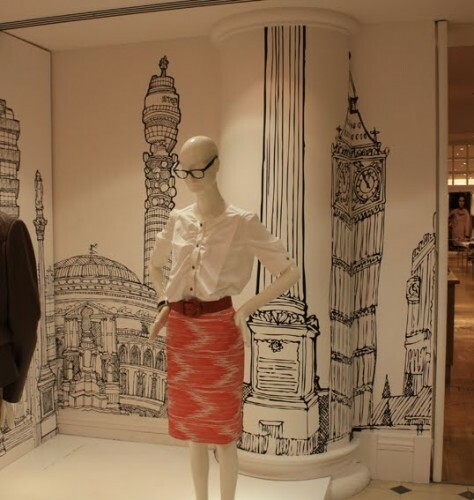 In addition, she was commissioned to produce illustrations for the windows of the Nicole Farhi Stores during London Fashion Week – busy girl!! These are a mere few of the many talented artists seen at Origin. Their handcrafted creations, many using repurposed or recycled materials, were an inspiration to budding creative types everywhere, reinforcing the value of handmade and that stylish and sustainable are not mutually exclusive. This entry posted in art, BlogTour, design, travel. Entry Tags: BlogTour2011, Gill Wilson, London Design Festival, Origins Crafts Fair London, Rebecca Coles Bookmark the permalink. quite amazing. what magnificent minds and hands and hearts opening up and sharing with us such originality. incredible work! you go girl!!! Thanks for posting handmade artisans’ work – it is always appreciated. You see the glow in their faces, try getting THAT from a machine!! So very beautiful. What imagination and creativity! Merci, Q. It always amazes me what ppeople are able to create, really love those paper works. So very cool. 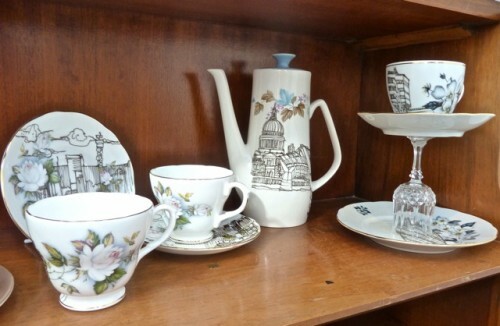 I loved them all, but would especially like to own some hand painted ceramics . Ooooo, would have loved to have seen this! Such love and care and artistry goes into work like this. I love everything you’ve shown. Jealous! Just to meet these wonderful artists and see their work first hand is such a pleasure. I am drawn most to Gill Wilson, I think you are right that they could add so much impact to a space. 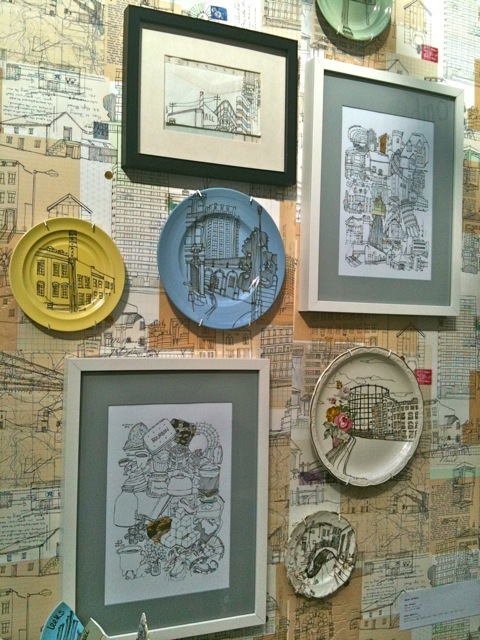 And of course, illustrator Esther Coombs, her work is playful, but still sophisticated. I like all of this. How on earth does Gill Wilson do that? So impressive. I can’t imagine how long it takes to produce. Rebecca’s work is quite lovely, would love to have some of it. I like “made not manufactured” very much. I also appreciate how cut paperworks balance precision with expression and these are certainly exacting! Thanks for recapping Origin;I am often notified of its arrival, but unable to just hop on over. . . I think you may like Vik Muniz’s solo exhibition at Sikkema Jenkins gallery in Chelsea (NYC, that is). It’s up now. Its’ funny how when I was young, I didn’t really appreciate art and artists as much as I do know. With 2 little creative souls that I’m responsible for raising, it is a high priority that they see, enjoy, appreciate and create art. 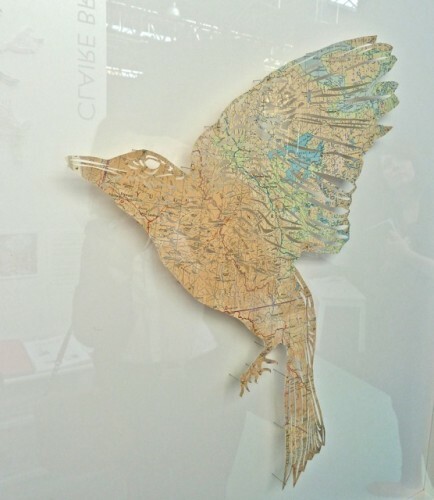 All of the artwork shown above is fabulous…but my heart really leaped for that bird!!! This is awe inspiring inspiration from some super talented artists! Was just catching up on your adventures in London…must have been one fabuulous trip! I LOVED this post. I forwarded to my friends and posted on our Facebook! How brilliant these artists are and I recognized the illustrations of the Anthropologie artist even before I read your text! I am going to go check out the pulp in acrylic though. Those are striking. Those girls should be teaching at Penland! What an opportunity for all you bloggers. 81 queries in 0.505 seconds.